We are offering a lovely 2015 buckling for sale. 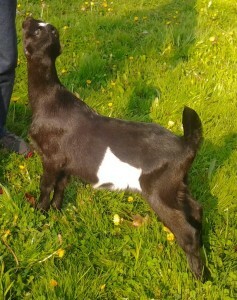 The following is a comprehensive break down of his maternal pedigree and some interesting supportive photos. Please visit J-Haven Acres and Autumn Acres websites to see additional information on this promising buckling’s paternal pedigree. Foxy is well blended, level and typical of a Talisman daughter. 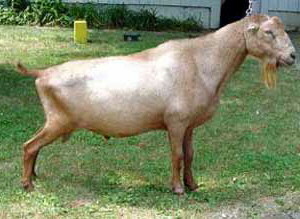 Her udder is globular, capacious, very smoothly blended & well attached all the way around. 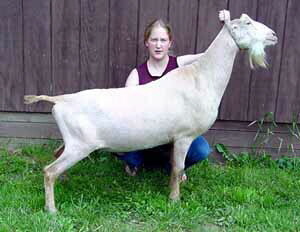 Together with her dam, Daisy, they were 1st place Dam & Daughter at the Dist IV Lamancha Showcase 2009. Foxy’s show career was cut short by a severe case of mastitis. She has now retired as a brood doe and is the type of doe that has personality in spades…the barn would be a dull place without her! This is a composite photo of the late 1*M Heaven Blessed XL Daisy taken at a show when she was an 8 yr old. I love the old does mammaries. She was a very dairy doe and she milked from that dairyness. Talisman was an amazing buck whose short use in our breeding program is still noticeable. He was very tall, sharp in the shoulders, angular, and level. He had a very square set to his legs combined with proper angulation to the hind legs. Tombstone was our foundation sire. He was a gentle giant. 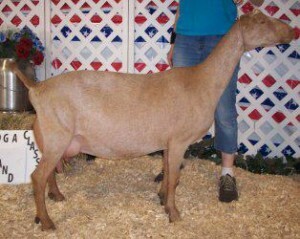 His offspring consistently excelled in dairy character, angularity and levelness.